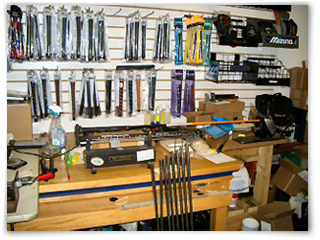 McMahon Golf also offers the most extensive Repair Centre in Southern Ontario, and services over 15 of the most popular and exclusive private golf clubs in the Greater Toronto Area. Our many years of experience have enabled us to work on equipment that many shops turn away. Our trained professionals using only the latest technologies in the industry ensure consistency and excellence on all work completed at McMahon Golf. This allows us to offer a lifetime warranty on all craftsmanship and a limited to lifetime warranty on all products to compliment our performance guarantee. It is for the above reasons, that many low handicap players, Canadian Touring Professionals and Long Drive Specialists entrust their game to McMahon Golf. Why shouldn't you? As we continue to evolve, we have not forgotten our road to success; we are continually committed to excellence, high quality craftsmanship and customer service.